Get superior coverage designed just for mobile homes from Foremost, the mobile home specialists. Is Your Mobile Home Protected? At Foremost, we know the coverages that are important to you as a mobile home owner so you get the protection you want for your home. As the leading mobile home insurer in the U.S., Foremost has specialized in mobile home insurance since 1952. A Foremost policy provides extensive, superior coverage for your home, personal belongings, other structures and personal liability. Foremost was the first specialty insurance company to insure mobile homes so you can count on our knowledge and experience. We know the coverages that are important to you as a mobile home owner so you get the protection you want for your home. A Foremost policy covers most direct, sudden and accidental physical losses like fire, lightning, explosion, vandalism, landslide, falling objects, explosion, attempted or actual burglary or robbery, water damage from bursting pipes, damage by wild or stray animals, collapse from the weight of ice and snow and wind or hail damage. This company has always been behind us all the way. (We) have used Foremost for 27 years with one claim. The agent was helpful beyond belief. And the rates are great! The customer service rep was wonderful. We were given guidance about how to prevent further damage. (We) were able to get the roof replaced quickly. Thanks! Service is excellent. Coverage is excellent and filing claims is a breeze, with very prompt payout. Purchase optional Replacement Cost coverage and get a settlement that reflects the cost to replace the damaged items with new property of comparable material and quality, without any deduction for depreciation. In most states, you can receive up to an additional 20% of the amount of insurance for your home if needed to replace your home. This provides coverage if you're found legally responsible for an accident that causes injury or property damage to someone who doesn't live in your home. It covers costs like their medical bills, lost wages, pain and suffering and property damage. We Include All the "EXTRAS!" If your mobile home is located in Texas, please contact Foremost to find out about mobile home coverage options in your state. 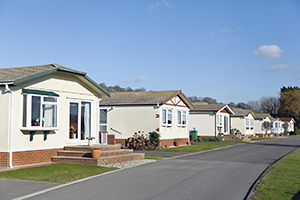 At Foremost, we insure mobile homes of nearly every type! Lifetime Continuation is a special feature only available when you purchase a policy through the AARP® Mobile Home Insurance Program from Foremost®. As long as you meet the Lifetime Continuation guidelines listed in your policy, you can renew your policy year after year, for as long as you like. Now that's security you can count on! If your home is destroyed by an insured loss, you receive the full amount of insurance for your home, minus any applicable deductible. Foremost offers a variety of discounts, such as a discount for having a central security alarm in your home. Discounts vary by state so be sure to ask our agent which ones apply to your location. Foremost claims adjusters are located across the country and they're known for providing fast, fair claim service. They know the ins and outs of mobile home construction so they can handle your claim quickly and accurately. Plus, you can report a claim by phone or online 24 hours a day, seven days a week, including holidays. If you'd like to budget your payments, you can choose from one, two, four, 10 or 12-payment plans. Ask our agent to explain how the plans work. You can also make payments online, view your bills online or sign up for electronic funds transfer. We want to make it easy for you to do business with us. *Lifetime Continuation not available in North Carolina or Texas. **Not available in North Carolina or Texas. Not available with all programs. Foremost® began offering the AARP® Mobile Home Insurance Program in 1989. Foremost designed this program with AARP members in mind. One reason Foremost is the leading insurer of mobile homes in the country is the outstanding coverage we offer. See how it compares with other policies if you were to have a claim. What if I'm painting my living room and a bucket of paint spills on my windows, walls and down through my heat vent? A policy with minimal coverage may not cover things like sudden or direct physical losses. You could be stuck paying for that paint removal out of your own pocket. With a Foremost mobile home policy, you'll have comprehensive coverage. That means most direct, sudden and accidental physical losses are covered. What if there is a natural disaster and my mobile home is considered a total loss? You may receive an amount to replace your home, but it may not be enough to get the same quality home. With Replacement Cost coverage from Foremost, you may be eligible to receive up to an additional 20% of the amount of insurance for your home if needed to replace it. What if the shed on my property is damaged? This may not be covered under a mobile home policy with minimal coverage. Your loss would be covered with a comprehensive policy and if you add Replacement Cost coverage, your shed could be rebuilt, good as new. What if a guest trips and falls on my porch and is injured? Depending on your coverage, this kind of accident may not be covered under your policy. You may be liable for medical costs, lost wages and more. With Foremost liability coverage, if you're found legally responsible for the accident that causes injury or property damage to a guest, his or her medical bills, lost wages, pain and suffering, and property damage are typically covered. Learn more about flood coverage.